The Park of Colfiorito is located in a sytem of level tectonic and Karst-valleys of large size between the Region Umbria and Marche, called Altipiani di Colfiorito [800 meter height]. The tableland is formed by seven valleys which are the grounds of ancient lake basins, which have dried out both naturally and by human interference. The Palude di Colfiorito (moor) is the most significative testimony of this complex phaenomenon: with a round surface of approximately 100 ha it has a dense aquatic vegetation. Because of its varieties of vegetal species and being an excellent habitat for aquatic birds the Convention of Ramsar declared the moor being of international interest. Around the Karst-basins, on top of the surrounding hills, lie the “castellieri”, the predominant settlement typology since the end of the 10th century B.C. until the Roman conquest. The only “castelliere” within the Park boundaries is the one of Monte Orve; the village of Colfiorito and the ruins of the ancient town of Plestia are as well part of the Natural Reserve. The grounds of the tableland are used for the cultivation of wheat and fodder, but mainly of lentils and red potatoes. Within the borders of the Park dairies transform the locally produced milk into excellent cheeses and into “ricotta” (sort of cottage-cheese). The village of Colfiorito itself offers a good level of receptive and recreational structures. The system of the tablelands of Colfiorito has an extension of approximately 50 km and its seven basins lie on levels between 750 and 800 m of height. The most important Karst-phaenomenon of the Colfiorito-moor is the Karst-pit of the Molinaccio. The moor-vegetation grows in characteristic concentric belts. The moor is an important halt for migratory aquatic birds such as herons, bitterns, wild ducks. In the near Selva di Cupigliolo live the eagle-owl and the wild cat. The presence of the Proto-Umbrian and Umbrian civilisation is witnessed by important urban remains and by necropolises. The most important Pre-Roman settlement is the one of Monte Orve, surrounded by a wall of calcareous blocks and which shows already some proto-urban characteristics. The area of Plestia instead already in 178 B.C. was a Roman municipium, in the 5th century had its own bishop and has been still mentioned in 996 in some documents of the Emperor Otto III. Under the pressure of the invasions by the Goth, the Longobard and the Hungarian, the urban structure collapsed and the inhabitants fled to the ancient “castellieri” on the surrounding hills. Since the 12th century the tablelands became the theatre of a renewed civil and political organisation through the erection of castles (Annifo, Lignano, Popola), monasteries (Sant’Andrea di Gricciano, Sant’Angelo di Bagnara) and hermitages. In 1269 has been built the Castello di Colfiorito, but the historically most important building of the area remained the church of Santa Maria di Plestia, built at the crossing of ancient roads on the ruins of a Roman temple and a palaeo-christian basilica. The Palude (Moor) is reached by the road from Colfiorito to Forcatura and may be visited using the many paths around its perimeter leading to the watching places which allow bird-watching even for persons with handicaps. Near a ruin of an ancient mill lies the largest Karst-pit (called “Molinaccio”) which swallows the waters of the moor. From here, a dirt-road leads to the top of Monte Orve, from where you have a panoramic sight of the Moor, the basin of Cofiorito and the basin of Annifo. On the road from Colfiorito to Pievetorina and Visso, you get to the Santuario di Santa Maria in Plestia and to the excavations of the town of the same name. The sanctuary is visited by pilgrims every year and monthly markets are held around the church from May to September. The crypt of the 11th century is particularly interesting: three rows of columns with antique capitals with geometrical decorations divide the ceypt into five small aisles. The arcaeological excavations of Plestia brought to the light late-republican buildings, the forum, a temple and other buildings with mosaic pavements and porticos; underneath the Roman buildings have been found the remains of a village of the Iron Age (9th – 8th century B.C.). Between the bottom of Monte Orve and the actual cimitery of Colfiorito have been found 250 inhumation tombs with ceramics, iron arms, decoration objects, of which the oldest date back to the 10th century B.C. Colfiorito lies in the middle of an ancient road system of pre-historic ages such as the Spina-road to Spoleto, the Via Plestina towards the valley of the Topino river and Forum Flaminii (Foligno/San Giovanni Profiamma), the itinerary through the valley of the Menotre river. Of more recent institution, the Sentiero Italia crosses the Colfiorito area from the near Monte Pennino (at north) to the Monte Tolagna. 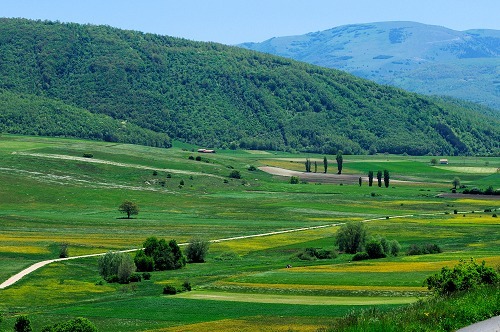 • The hotel is located in the middle of the Park of Colfiorito at 780 meter height near the cities of Foligno, Spello and Assisi, surrounded by green landscape and an ideal climate. You can practice trekking, mountain-bike and other sport.